I intend to use the top five tanks on the rack (see attached JPEG) for brood stock while I get good at successfully bringing clutches through metamorphosis, and use the bottom five for grow out of the few survivors of the initial clutches (trying to be a realist). Once I can consistently achieve high survival rates, I will construct a grow-out system and fill the bottom five tanks in the brood stock system with more brood stock. I need to stay within some financial constraints (wife: "HOW much are you going to spend on your fish-stuff!?!?!?":? Me: "It will pay for itself... over time... hopefully... ":lol:) so based on my design and intentions, does ~$1,500 sound like an accurate number? Any and all feedback would be greatly appreciated. I would say 1500 is a good start. I would suggest starting small. Your system design looks similar to mine that i slowly built over a few months. I'll see if I can dig up some pics. If you have a display set up now, I would start by getting some pairs established while construction is underway. Remember is next to impossible to over skim...you can always feed more, so don't cheat on that cost, check local forums for used skimmers and equipment to save money. No rush. I have A G# on my 130 gallon Broodstock system and wished I went bigger. Stick around and Read, read, read. That is the key and Welcome to Mofib. I did this for around $2000, but it is a little larger. However, this isn't done. It needs another $500 or so in insulation and PVC. Wow! Thanks everyone for your responses! I have that strange first-date excitement going on. Kmiec123: I like your setup. 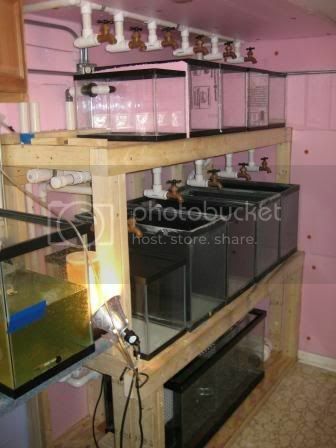 I was considering going with larger tanks on bottom like you did, but 10 gal tanks are so cheep. Does the benefit of having larger capacity brood stock tanks out weigh the tank cost? Also, you make a good point about being able to feed more with a larger skimmer. 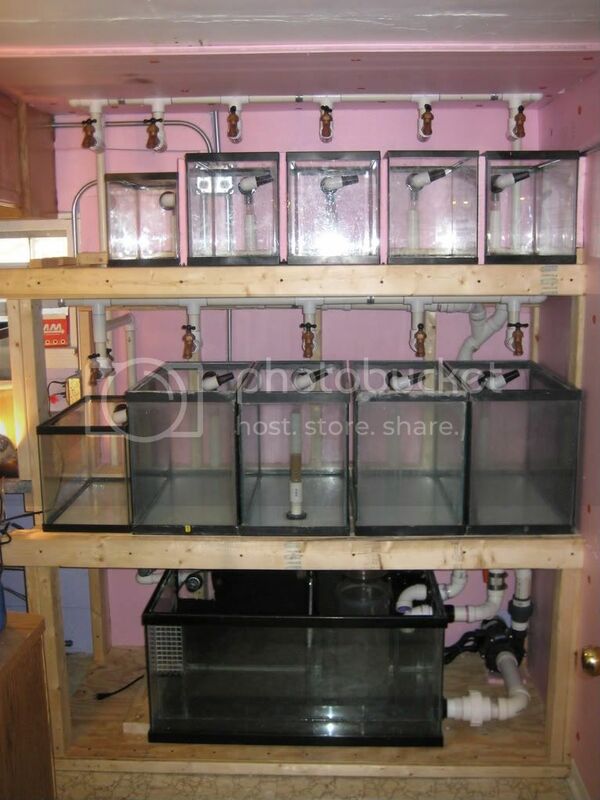 I have been looking into making a large DIY skimmer, but am not sure if this is the best way to go. Does anyone have experience with DIY skimmers on large systems? Scott: I have been following your thread... well I haven't been around long enough to follow it, but I have read it several times. I got the idea to put in an algae scrubber from your thread. How has that worked for you, by the way? Will you be insulating the garage? Lastly, I was reading somewhere that having a good algae scrubber can significantly reduce/eliminate the need for a skimmer. This is unconventional at best for me... any opinions? The algae scrubber is an interesting Idea, I would like to play around with, but have not as of yet so I have no personal experience to offer. There really is not much benefit to the larger tanks, unless you were planning to keep a species that required more space. I have put some rock in a few to help with pop populations and such. If you keep your growout separate, you can maintain better broodstock water quality and have some mini reefs and multiple pair and species if you like. I was just trying to keep myu options open, since I still consider myself a hobbist and not a breeder. I agree with the small tank idea. Larger clown species might do better with a 20 than a 10, but people do it with 10's. If you want testimonials. (I know the name is cheesy, but) A perfect plant food is animal waste. That's how the oceans clean the water (plankton). I can't see why it should be any different in captive systems. Especially if you can use Natural sun light. Insulation: I've got the roof and door done. I'll insulate the other 3 walls this fall. Everything here is on a 'need to do' basis. Here's a link to my set up: http://www.masm.org/mforums/tm.aspx?m=18311 It's a long thread but you might find some of it helpful. As far as cost goes, I've saved all my reciepts but have not added anything up, Im afraid to. Fishtal, I just read your thread over on masm, that is long! Really nice job, it looks awesome. I'm a big fan of using algae to help remove waste. But I hate scrubbing algae. So now I'm a big fan of breeding snails. Snails are a lot easier to pull out and sell to someone nearby. But algal systems rock. With the amount of food you'll be feeding the broodstock and a starter population of different sorts of pods, you'll have tons of life living in the algae. Your goal is to make the algae tank the very best place in the system for the algae to grow: the best light (very yellow), flow, lack of herbivory, etc. That way, algae growing there will outcompete algae growing elsewhere. One option would be to take a screen shot of it, then just edit it in gimp or whatever photo software you use. Thanks for posting that link, fishtail. I can't believe you took the time to paint the PVC blue! Dedication!!!! It looks like it wasn't that much more of a hastle to break your set-up into two different systems. It is the rite thing to do, but an extra skimmer, UV, retern... I guess it boils down to this: If I buy 5 unproven pairs once this system is built, how long will it take for the brood stock to generate significant numbers? If it takes 6-8 months, it makes sense to me to run all 10 on one system leaving the bottom 5 dry as a back-up, and construct the grow-out system while the brood stock is maturing. If it generally takes 2-3 months, I should bite the bullet and plumb two systems. Um Fish: what kind of snails do you breed? Do you have any quick run-down sources -- something about a thousandth the length of fishtail's epic saga? I like the idea of snails, but they wouldn't remove waste from the system, necessarily, wouldn't they just convert what they eat into something else that remains in the system? Kinda like a slimy Band-Aid. General question: Is it better to have a few large grow out tanks housing lots of fish, or a lot of small tanks with moderate numbers? IMO it would make sense to have lots of small tanks so that you can have an easy cycle through the levels of maturity (i.e. oldest and closest to market on the right, just transferred on the left, etc...) so you can simply disconnect the "ready" tank from the system, transfer the fish into a travel container, and use that now empty tank for the next batch. Oversimplified? Looks like it worked! Thanks, Scott! Looks pretty good to me. If you want input, I'd increase the plumbing section to $200, and use unions all over, and add threaded pipe adapters to all the valves/unions. Its a pain at first, but it really pays off when you start changing/cleaning. What are you thinking of using for broodstock food? What type of larval rearing will you do? Instead of unions, for tank removal, I used a barbed fitting with a piece of hose that slips inside or a 1.25 inch stand pipe for the drain. When I empty a tank, I can just slide it up and off the rack system. Seems to work good. If I did it again I would not use 1.25 inch fittings, I would just go with 1.5 inch fittings. The cost difference with the 1.25 inch, being much higher, just don't seem to be worth it. I definitely recommend Valves and unions by the pump to make it easy to change out if need be. Hope this makes sense and you can see what I'm talking about in the pictures above. Thanks guys. I like how my system turned out. Sorry for the "epic" length of the thread. If you start with unproven spawning pairs it can take anywhere from 3-6 months, possibly longer, for them to get comfortable and spawn. It was actually my P. fridmani that spawned first but I haven't had good luck getting them to sellable size, yet. 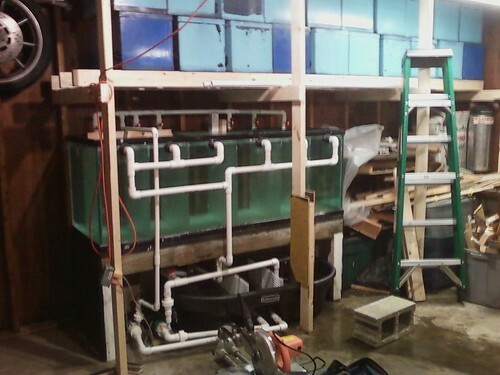 When I started out I was told that it was best to have the broodstock and grow-out plumbed separately so that is what I did. I didn't start the grow-out system until I was getting close to needing it. I didn't fill all of the grow out tanks to start with either... I started with one and filled the others as they became needed. One thing I didn't plan for in the beginning was tanks for artificial incubation and hatching. I ended up setting up another rack with stand alone 10G's for that. I covered that in the last page of the thread. fishtal wrote: I didn't start the grow-out system until I was getting close to needing it. . I'm planning on starting that this week. A part of me doesn't want to go through with the actual build of this systems; I oh so love the planning phase! "What are you thinking of using for broodstock food? What type of larval rearing will you do?" I have been playing around with formula II food in my display tank and I am not a fan so far. It is this gelatinous mess that, when I try to reduce it to manageable sizes, disintegrates in the tank. I would like to use a pre-packaged frozen food for the sake of me being a lazy arss, but have been toying with the idea of making my own out of fresh see food and nori. Recommendations? Please! As far as rearing goes, I am undecided. I want to have whatever container it is to be orb-like as to maximize the oxygen distribution, and plastic/acrylic so I can experiment with closed loop set-ups - I don't know if it is even possible (I will most likely default to air stones), but it never hurts to experiment/leave options open. I have been reading up on green water and rotifer culturing but have yet to try. I think I will wait until I need them to start the experimentations... priorities. Fishtail: Incubation?... That is a new one for me. I was under the impression that you can either have the eggs hatch in with the brodstock and transfer later or move the tile and father into the rearing tank until hatch at which point the male goes back. Is incubation a third option? I need to look into that. After reading your thread, fishtail, (all but the last page apparently) I have not been able to stop thinking about splitting the two banks of 5 ten gallon tanks into two systems. One organization scheme I have been pondering as a result is having, eventually, multiple racks of identical design with broodstock on top and grow-out on bottom - each on separate systems. The question then becomes: how much "tank" will I need for grow-out to keep up with five breeding pairs? Well... Thanks to all for your insights. I hope to have something tangible to post sometime soon, but I want to take my time and make sure I think things through so I can follow-through. You do have to be careful, because it don't take much to crack a 10 gal. tank with a bulkhead in it. But the 1" bulkhead had a 1" slip to 1" barbed elbow with a 6" piece of 1" ID hose that slips easily into the 1.25" stand pipe. Can't help with the noise, I don't hear anything over my main display tank pump....it's loud as hell, but is still working, looking for a Pan world impeller for the back up to become the full-time quiet pump. I really don't think there is enough flow for a slurping noise though. o' one more thing....Your valves for the incoming water.....The valves I used were inexpensive, but the slashing made it impossible to keep up with salt creep. I since used adapters to line-lock...much better. So if you buy the line-lok valves, they are a bit more money, they will save in the long run by the time you get adapters and fittings, etc. 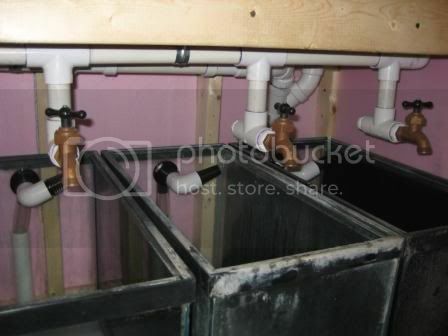 What about standard PVC ball valves with some extra pipe extending into the watter - Like Scott's setup? Would that do the same thing? I personally like the directional control of loc-line, but it may not be worth the expense in this situation (that is if PVC serves the same function). Just wanted to go off record and share with everyone that I had an interview today (I am currently un-gainfully employed) which I killed! Not that it has anything to do with breeding fish; I just spend so much damn time on the subject that I feel somehow connected to all of you... weird isn't it? Believe it or not, I voluntarily quit a General Manager position in the Bay Area to come up to Washington state. I eventually came to the conclusion that I would rather live under a bridge than spend 16 hours a day, 6 days a week, doing something I hate. I love (obsess over) my reef tank and would be thrilled to eventually turn that obsession into a career. But for now, I am going to try sales. Wish me luck! Good choice on the move, my sentiments exactly. Food: I have a few make your own recipes, I'll let you know when I know how they are. I agree, do what you need to when you need to. Incubation: Many people move the eggs (on a tile or flowerpot) and use air bubbles or a small powerhead to incubate them artificially (with very good success). If you want to grow out all the eggs that are produced by 5 pairs (of clowns), I'd use at least 400 gallons. I bet people do it with less though. There are a lot of nice set up and there all custom made to your need I like that .